It been around a few weeks or so since the launch of Visibly Indivisible, a pairing between Starbucks Coffee and the Opportunity Finance Network, which its goal is do what everyone in America is wanting many of the CEOs of large corruptions to do, Create Jobs. Howard Schultz CEO of Starbucks, goes without saying, has been very vocal in the news about his stance on the Occupy movement, and the current economic condition of our country, many people however did see this as attempt to protect his CEO charm, and more importantly his CEO salary. But, the new campaign for Starbucks is clearly the CEOs honorable action to put his money where his mouth is, an action that seems to be the only action being taken in the situation by one of the most known CEOs in our country. I must say I have yet to post anything about the movement we are seeing in the news. Occupy Wall Street, is a movement that some would say is defining us 80s babies as being among one of the most vocal generations. To be honest, whether you agree with either side are not, in “My Opinion “,it’s a true testament to the ideals of America, I may not be a member of the movement, but im always a supporter of public demonstration which defend civil rights, and high light Civil disobedience , i.e. the misbehavior of corporate America, and the Lack of Jobs. The movement has come under much fire, with the lack of a leader, or the lack of a leader and demands, none the less it’s all very empowering. The movement is present in all major cities, including right here in DFW. (DFW Occupy seems to be a mess however, we will see what DFW has in store now that the Occupy was raided and cleared out by court order) Bottom line to all of this, well at least one bottom line, is Job Creation. “Our America” some how has taken on the new reputation of the land of Corrupt Executive Operations “C.E.O.”, the new definition of the title according the Occupy, or what I have seen written on cardboard signs at least. Yes we get it, the lack of Jobs, is painful, especially for people in my age group of 22-32, and even more devastating the lack of jobs being held and awarded to our veterans, heartbreaking. Although I am not a part of the Occupy in my city, I know what its like to be unemployed, and struggle to hunt for a Job, that after attending College, was promised jobs, but some how they fell short, However this didn’t stop me in creating a job for myself. I come from a rather large entrepreneurial family, and the platform of which you are reading this very entry, is a product of my unwavering will to succeed, that in the long run, will create more jobs under my umbrella. 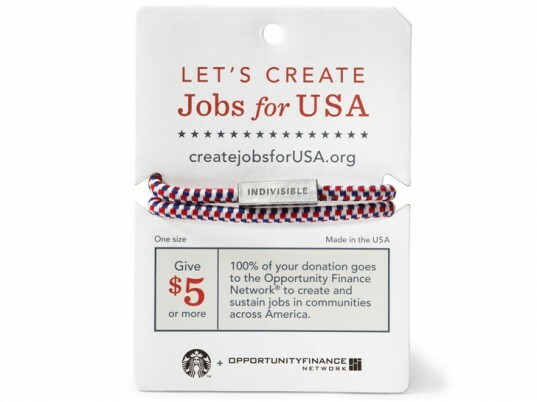 Which brings me back to The Starbucks Campaign Visibly Indivisible, The Starbucks Company throughout the holiday season will be selling $5 red white and blue bracelets at its stores nationwide. Each bracelet cost $35, however we as consumers pay only $5 and Starbucks in turn will pay the actual retail price to the Opportunity Finance Network. Whats the point in this? well, in America it cost $3,000 to create one job, an at $35 a pop, not to mention how many times we walk into a Starbucks. The math will undoubtedly grow exponentially. I know I know, we have seen many of these retail based charities happen, but i find this to be one of the most notable, for it is fueled by someone who’s title has taken on such a negative light, a C.E.O., who although is at the reign of one of the most profitable companies in America, is showing that he also is affected by the economic downturn that is affecting everyone. So stop in and purchase your bracelet and help create job. Did I mention that these bracelets are as well made in USA, so they are made by Americans for Americans, and we all know how rare that is, it’s a Fashion-STATE-Ment that is trending now! This entry was posted in | and tagged AMERICA, CEO, Charity, ELECTIONS 2012, HOWARD SCHULTZ, JOB CREATION, OBAMA, OCCUPY DALLAS, Occupy Wall street, OFN, STARBUCKS, USA. Bookmark the permalink.